It’s clear the publishing industry is in need of diversity—but how do we accomplish that? 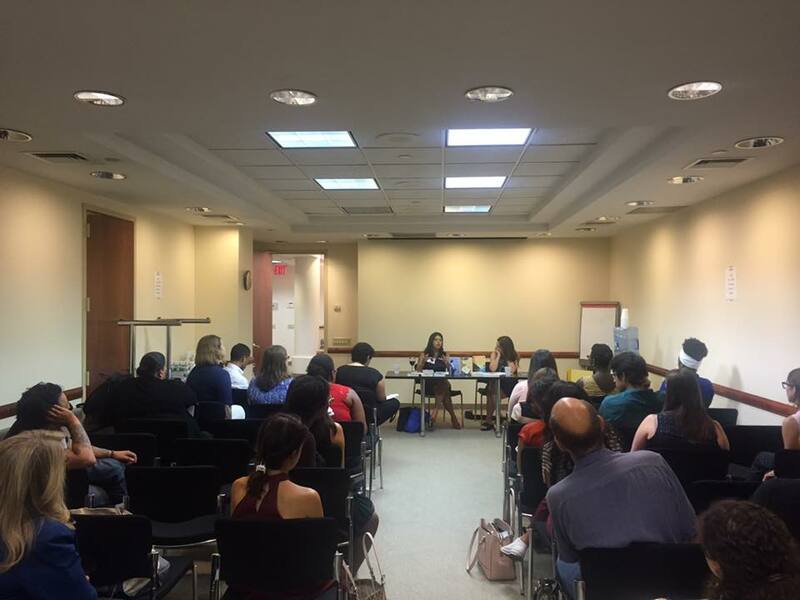 On Thursday September 8th Andrea Montejo, founder of the Indent Literary Agency, and Johanna Castillo, Vice President at Simon & Schuster’s Atria imprint, came to together to discuss their career paths, diversity in the workplace and market, and new frontiers in Spanish-language publishing. The panel began with brief introductions before Montejo took over as interviewer, asking Castillo how she got started in publishing. Originally from Ecuador, Castillo worked in finance there before moving to New York to pursue a career in publishing. After various internships and some networking she became a literary agent at Greenburger Associates, exclusively representing Latinx* clients. A few years later she moved to Simon & Schuster, where she now edits books in both Spanish and English. Castillo has approached the literary world with a keen eye for emerging markets. The Latinx audience is historically underserved in the United States, and Castillo offered helpful insights into researching it. In both New York City and Miami, where she lived prior, Castillo conducted research into the Latinx reading community through researching her books’ sales figures in bookstores and adoption campaigns. Castillo soon took over the questioning, asking Andrea Montejo about her own career path. Originally from Colombia, Montejo attended university in France and moved to New York City for the Columbia Publishing Course. She decided to stay, and eventually became a founding editor of the Rayo imprint at HarperCollins, editing English and Spanish-language titles by Latinx and Hispanic authors. In 2007 she began her own literary agency, Indent, where she currently represents a number of Latinx authors. Questions from the audience prompted both speakers to answer: in today’s publishing world, what voices are they still looking for that might still be underrepresented in contemporary literature? There are still some Latinx cultures that are underrepresented even amongst Latinx authors, Castillo noted, such as Venezuela and Nicaragua. And in some cases, certain prominent writers, such as Junot Díaz, are seen as the “go-to” for a certain viewpoint (in Díaz’s case, Dominican American). Although there are successful and prominent Latinx authors who have managed into “mainstream” literary culture, many other ethnically and culturally voices remain unheard. Through diversifying what we, as publishers, produce, we can make space for multiple perspectives from each community, rather than limiting it to one or two authors to feel that we have done our part. Both speakers agreed that, although they seek out Latinx voices and literature that focuses on Latinx characters and cultural issues, good Latinx fiction is good fiction first and foremost. In addition to cultural diversity amongst Latinx authors, Castillo is also always on the lookout for historical fiction featuring a strong female voice. Montejo seeks memoirs and biographies as well. As members of the publishing industry diversify, the books that get published do too. Editors and literary agents like Johanna Castillo and Andrea Montejo have brought books into the world that may not have had a chance otherwise, because they searched for and discovered diverse and previously unheard voices. These two are proof: Latinx voices matter. *Latinx is a gender-inclusive term for Latino/Latina. This article was contributed by YPG member Celine Aenlle-Rocha. For more information, visit our Contributing Writers page.